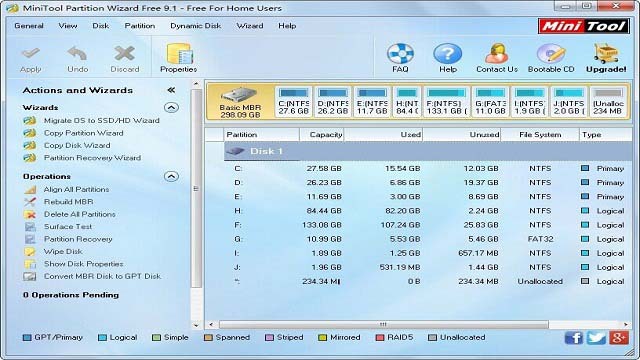 Minitool Partition Wizard Home Edition free download for windows pc. MiniTool Partition Wizard is one of the most popular hard disk partition tools and it was one of the top 10 windows APPs on CNET and Filehippo. This is the full version of Minitool Partition home edition software. It is used to create, delete, resize or format the hard disk partitions. Create Partition enables users to create new volume with specified unallocated space (if there is no unallocated space available, try “Move/Resize Partition” to release). Delete Partition feature enables users to remove a specified partition off. Hide Partition feature enables users to hide/unhide partition. Easily change the drive letter for partitions. Move/Resize Partition feature is capable of changing partition size and location in Windows with ease. Partition Recovery Wizard:- This feature can recover lost/deleted partitions. And it can recover lost data at the same time as long as new partition hasn’t been created. If you want all the advance features you can download MiniTool partition wizard professional edition here.